TAME recently had a sudden call for a jet engine to be transported from Houston. So who did they pick up the phone to call again – Prime Air & Ocean Cargo, of course. 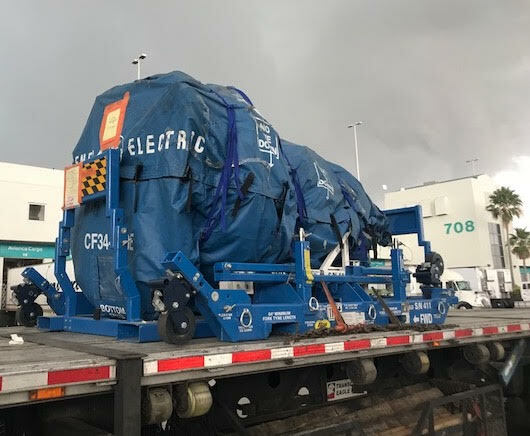 That’s because we’ve been handling parts shipments for the flag carrier of Ecuador for years and knows they can totally depend on Prime Air & Ocean Cargo has for shipments big and small – and huge, such as a multi-million engine. Whether it’s one box, one pallet, an aircraft engine, or a company-wide logistics management operation, Prime Air & Ocean Cargo has a unique ability to streamline, optimize, and expedite freight, and logistics solutions. The company’s experienced staff takes works closely with and for the customer to shorten the shipping process, cut transfer times, and move paperwork efficiently and swiftly. Prime Air & Ocean Cargo is part of international import-export logistics conglomerate Prime Group, founded in Ecuador in 2001. For information, send an email to info@primegroup.aero or visit www.primeaircargo.com.